Tips from the Pros! Our professional staff will give you pointers on making your pointer point like he's never pointed before. There are many schools of thought regarding the best methods for training a finished retriever. The extent and style of training will often depend on the activities you plan to perform with your dog. For example, your standards of acceptable training may be very different if you plan to do a lot of Hunt Tests or Field Trials versus an effective dog for recreational hunting. We tailor our training to the individual needs of the dog owner. Most retrievers from good hunting lines will show natural tendencies to hold, carry and retrieve objects in their mouths. Some pups will retrieve directly to your hand with very little or no training. Others will drop things on the ground or just run around playing keep-away. 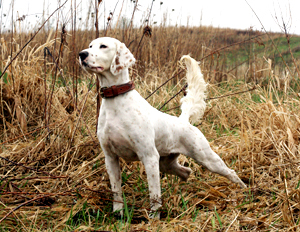 Our goal is to develop a finished bird dog that consistently delivers birds to heel and hand. In order to achieve consistent delivery, force/hold and force-fetching a puppy is ideal around 6 months of age or whenever his adult teeth have come in. Whether for hunting or competition, there are some basic "Do's & Don'ts" for retrieve training that are fairly constant. These are essential to build the foundation for a well conditioned bird dog that consistently retrieves to your expectations. When the pup gets to the point it is no longer returning to you with an object, put a check cord on the pup so they are forced to return to you. Praise your pup when he returns to you and while he is still holding the object in his mouth. Do not remove the object immediately, let him hold it and praise him. Watch the corrections you give when retrieving. Higher drive pups can be corrected more while with a lower desire retrieving pup you may need to do less correcting. Start by throwing retrieves in confined areas. This helps limit distractions and encourages direct returns. A hallway works great for doing this. Avoid training sessions being too long. Keep them fun and make them successful. Introduce your pup to birds and feathers as young as possible. Getting a puppy into water at a young age is always a great idea as well. If possible, it is much better to avoid undesirable behavior from the start since it is much easier to learn proper behavior when you don't have to unlearn improper behavior first. From a very early age, it is essential to consistently reinforce the behavior you want. If the pup is picking things up and carrying them, use encouragement to get him to bring it to you. When he brings it to you, praise him and let him enjoy the prize with you. The most important thing is to start your pup off right by making it fun to retrieve the right way every time. Everything that we do with our dogs is conditioning some kind of behavior. If we allow a dog to act a certain way for an extended period, it will be that much harder to recondition him out of that behavior. If we start right away, when the slate is clean, it's only a matter of consistency. To begin retrieve training, it is best to keep your dog on a check cord while you are working with him. This way if he stops short, you can pull him in the rest of the way. When he gets to you, let him hold onto the bird for a bit. He's just as excited to have it as you are that he brought it back. If you start reaching to take it right away or even roughly telling the dog to drop it, he associates returning the bird with immediately having it taken away or you speaking roughly to him. As you can see, it may be confusing to the dog and promote them to stop short of you. When a dog gets a retrieve, we talk to them on the way in, "here" "good boy" and clap or use a whistle. This gets them to feed off of our excitement and want to come to us. We also back up, which helps the dog to come in all the way. Once they get to us, we hold their collar with our left, or right, hand which ensures that he stays with us. And pet him with our other hand, which ensures him of his job well done. We continue to verbally praise him as well. We want the dog to know that when they bring something back to us they are the best dog in the world. If you get that message across, he is very likely to want to do it again. The fail safe way to get a bird out of a dog's mouth is to pick up on their flank. This is the flap of skin that runs from the back end of their ribs down to their back leg (if you look at the profile of a dog, it's below their waist). If you have praised your dog for 30 seconds or so, reach down to their flank with the hand which is petting the dog. As you gently pull up, put your other hand on the bird. Take the bird as he opens his mouth. If he doesn't let go, pick up a bit more. When you pick a dog up in this area it's uncomfortable. He will naturally open his mouth due to discomfort. If you continue the praise after you have the bird, the dog will have no idea what just happened, but he will know that he's having fun and want to do it again. One final thing to keep in mind is to keep your sessions short so the dog never stops having fun. If he only retrieves well 5 times, then keep his session limited to 3 retrieves. You always want to leave him wanting more so he doesn't get burned out on it. It also helps to change things up. Use a frozen bird one time in the back yard, then use a bumper the next time after a drive to a park. Just remember that if you go some place new, he'll probably want to check things out a bit before he's ready to play a retrieving game. Maintaining a hardworking dog in healthy body condition is critical to his health and performance in the field. Body condition tells whether a dog is too thin, just right or overweight, without actually putting the dog on a scale to measure body weight. Dogs maintained in ideal body condition look and feel healthy. Importantly, this is reflected in their field performances as well as their energy levels at home. Knowing how to assess ideal body condition is important for two reasons: first, ideal body condition is associated with a healthy proportion of lean tissue, or muscle, and body fat, and second, most owners don’t have a scale ideally suited for dogs. You should regularly monitor your dog to ensure he is getting the right amount of food to maintain an appropriate weight that contributes to overall health. Very simply, this involves using your eyes and hands to observe subtle changes, as opposed to trying to get your dog on a scale on a weekly basis to monitor body weight. Regularly observing a dog’s body condition will help you assess whether changes need made to his calorie needs, as you progress through the season and all year long. The Purina Body Condition System is a nine-point scoring system, developed by a Purina veterinary nutritionist, that will help you determine whether your dog is too thin, ideal or too heavy. It is important to talk to your veterinarian about your dog’s overall health and body condition. Do you have a young puppy or a young pupil who recently finished his/her first wild bird season and you want to continue that improvement for next season? Or perhaps you have a seasoned veteran who might need you to brush up his skills. Let's face it, bird hunting trips are only as fun as the dogs and people we are with. A disobedient dog can make a hunting trip downright miserable. A young dog may be tempted to riot in surroundings different than the familiar training grounds. Or the seasoned dog may become unruly as the season progresses. Wild birds tempt a bit more than in training. Circumstances are a bit less controlled and sometimes you may go for hours before encountering game. How do we maintain the good habits we worked so hard on during training and yet enjoy ourselves? During the summer we spend a lot of time with the youngsters properly building the foundation for our program. They are worked daily in the yard in basic obedience such as hup, stay, recall, retrieving, kenneling, etc. Good responses to these commands are essential, not only for safety, but for a good day afield. A flushing dog that continually hunts out of gun range is useless. Make sure they find lots of birds while working an appropriate pattern for the cover and wind. Our spaniel training program is reward based. 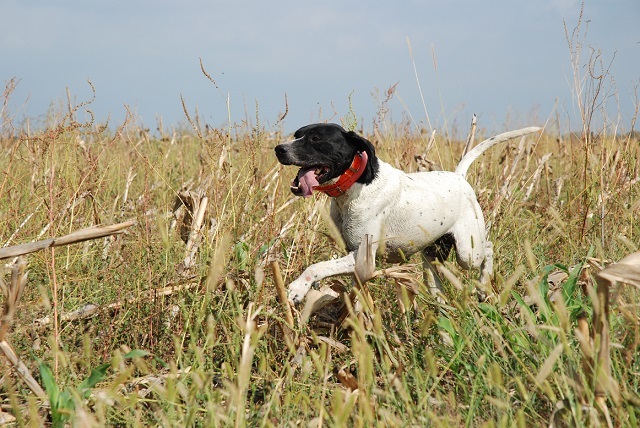 Hunt within range and you will find birds and get lots of retrieves. We usually introduce pups to quartering and retrieving on pigeons. Once they work well on pigeons, move on to game birds, such as pheasants or chuckar. Take your youngsters for walks where they will encounter wild game prior to the season opener. I usually get in some early scouting and pup gets some work on game birds - awakening the nose a bit more than a pigeon. When appropriate, we introduce gunshot. Improper shooting over a young dog can turn off even a hard charging spaniel. It can be prevented with a little care and training. Sometimes folks get so wrapped up in shooting they forget there is a dog down field, which may not like getting the muzzle blast. We introduce the shot in progressive steps, which the dog associates with a retrieved bird. Enjoy these tips to have a more enjoyable hunt with your young or old hunting companion. 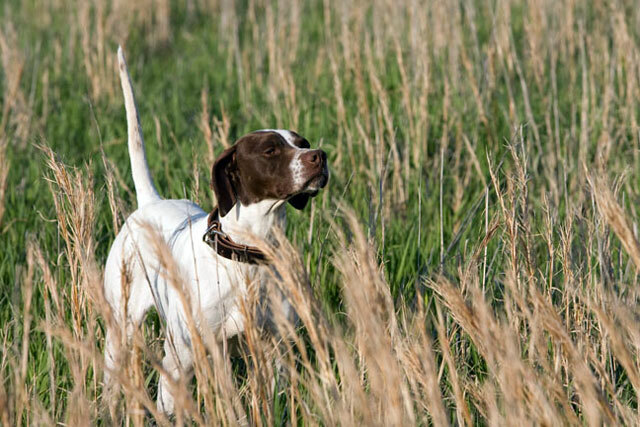 For pheasant hunters who also moonlight as deer hunters, the biggest drawback to pursuing the ungulates is the absence of perhaps the most appealing aspect of bird hunting – the dog. 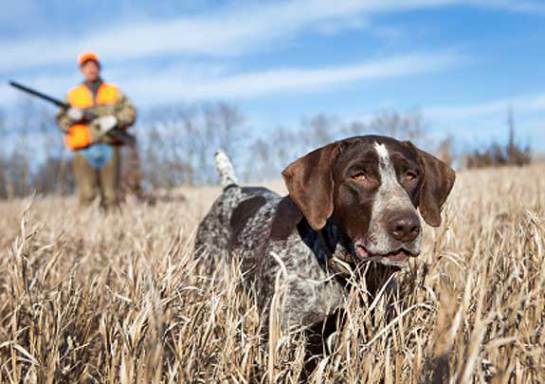 Enter shed hunting, an activity blending bird dogs and bucks, which may be just the ticket to get your bird dog out of its offseason training rut. 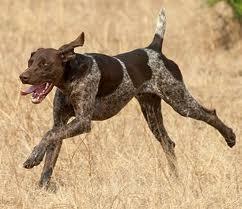 What Bird Dog Breeds Can Be Shed Dogs? According to Tom Dokken, legendary dog trainer and owner of Dokken’s Dog Supply, current shed dogs are mainly Labrador Retrievers. “The strongest breeds are the ones that are going to pick something up,” Dokken says, alluding to Labs and Golden Retrievers. 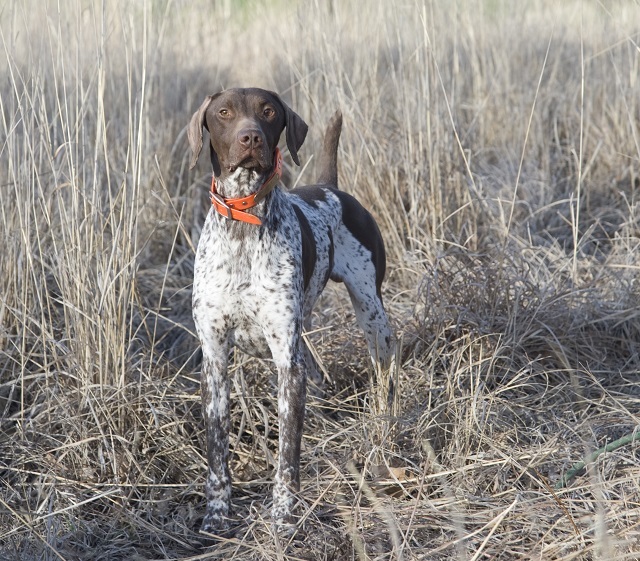 Bird dogs can easily pick up shed hunting, and in short order, Dokken points out. “Think of it as an upland hunt, but for antlers,” he says, “The dogs are using their hunting drive, their noses and working on retrieves, so it’s really a way to extend the hunting season.” That goes for the trainer, too. “It really feels like I’m going on a hunting trip,” he said as he and his dogs prepared to head west to South Dakota in search of sheds this April. Fortunately, quality shed hunting can be had almost anywhere these days, including suburbia, and isn’t exclusive to just whitetail deer antlers – bird dogs can also retrieve mule deer, elk and moose sheds. Will Shed Hunting Ruin My Pheasant Dog? In a word, “No,” Dokken says. “Hunting for sheds doesn’t mess up a pheasant dog, there just isn’t that competition between birds and sheds,” Dokken adds, “The antler can never take the place of a living, breathing, good-smelling and exciting live bird.” As easily as bird dogs can pick up shed hunting, the transition back to doing what they do best, hunting birds, is just as seamless. While places to hunt abound, the most important element is, as with all things dog training, finding the time. “It’s not something you need to train your dog for years to do,” Dokken says, “It’s simple stuff you can do at home.” While Dokken runs a 12-16 week shed dog training course (www.dokkensoakridgekennels.com), he’s seen dogs pick it up in a matter of weeks. To a bird dog, a hard shed antler, unlike a soft, well-scented pheasant, typically takes some warming to. Dokken, who doesn’t use treats when training dogs for upland birds or waterfowl, does use them for shed training. “A treat let’s the dog know it’s worth picking up,” he says. Dokken recently hosted the first ever World Shed Dog Hunting championship at his Oak Ridge Kennels in Northfield, Minnesota. Of the participating dogs, Dokken said 80 percent were “bird dogs.” The amateur and junior divisions at the event were won by Lee Lakosky (from The Crush on Outdoor Channel) and his Lab, Tank. To perform their best, hardworking dogs must maintain an ideal body condition. Training activities, your dog’s metabolism and nutrition contribute to his body condition. It can be a challenge to keep weight on some canine athletes because regular exercise not only increases the calories an active dog burns, it also increases overall metabolism. Just like people, some dogs naturally have a higher metabolism. “A dog that is losing weight, particularly muscle mass, is in a catabolic state and may be more susceptible to injury, illness or slower recovery,” says Purina Nutrition Scientist Brian Zanghi, Ph.D.
Intense training coupled with suboptimal nutrition, especially insufficient intake of protein, can cause a catabolic state. Since protein nourishes muscles, underweight canine athletes that do not receive adequate dietary protein may suffer from fatigue and inadequate recovery, which ultimately may impact their performance. “If a dog is underweight, feeding a nutrient-dense food may help him in achieving a stable body weight and an ideal body condition,” Zanghi says. If a dog seems fulfilled with his normal daily feeding portion, but still is underweight, feeding a food that is more nutrient-dense may help the dog ingest more calories with a smaller portion size. “This will help the dog get the calories needed before feeling full,” Zanghi says. Dog food formulas that contain higher proportions of fat are more nutrient and calorie dense. Performance formulas with 28-30percent protein and 18-20percent fat will deliver more concentrated nutrition compared to maintenance formulas with 22-26 percent protein and 12-16 percent fat. “More important than enriched calorie content, the higher proportion of dietary fat in a performance formula helps ‘prime’ your dog’s muscles to better adapt to exercise and endurance,” says Zanghi. Sometimes dogs that are underweight are not motivated by food, so it can be harder to get them to eat. Adding hot water or Purina Veterinary Diets FortiFlora as a palate enhancer to the dog’s food can stimulate a greater desire to eat, particularly when traveling or boarded. If a dog is routinely eating twice a day, it may be helpful to switch to once a day, such as after the dog is done exercising or training for the day. His post-workout appetite may improve his ingestion volume. You also should consider whether other dogs in the home or kennel may be having an influence on the feeding behavior. If so, they may need to be fed in separate locations. When it comes to assessing your dog’s body condition, you need to know more than just a number on a scale. “A dog’s scale body weight tells us nothing about the amount of body fat relative to muscle mass,” Zanghi says. By noting some simple features of your dog’s body, you can make a general assessment of his body condition and monitor his body fat. Dogs that are overweight are more susceptible to joint-related health concerns as added weight places extra stress on the joints of an active dog. To determine your dog’s body condition score, examine his physique by putting your hands on the dog and feeling his ribs. Place both thumbs on the dog's backbone and spread your hands across the rib cage. You should be able to easily feel the ribs. You also should be able to view the dog's waist behind the ribs, and an abdominal tuck should be apparent from the side. This is a convenient way to monitor your dog throughout the seasons to know if you should be adjusting your dog’s daily food portion to meet his caloric needs. Monitoring your dog’s body condition and feeding a high-quality, nutrient-dense food will help ensure your canine athlete is performing at his best. Owners of hardworking dogs know that stress is a natural part of competition. The duration and intensity of the activity, travel and exposure to other dogs in a different environment are all contributing factors. Exercise is a natural stress that challenges the gastrointestinal (GI) tract. In addition, a dog's GI tract is associated with a large portion of the immune system. Here, specialized cells help protect the body against invading organisms, such as pathogenic bacteria and viruses, while recognizing beneficial bacteria. Some athletic dogs may be prone to develop digestive upset due to the stress of exercise during both training and field events. When the digestive tract is inflamed, digestibility and absorption of nutrients are reduced, potentially compromising your dog’s performance. Owners of dogs with digestive upset may notice a decrease in stool quality and a reduction in both energy levels and performance. More serious conditions can result from long-term digestive upset including dehydration and weight loss. Skin problems may also be associated with digestive upset due to malabsorption of nutrients vital to maintain healthy skin and a shiny coat. “Owners may notice a dry, dull coat or irritated, flaky skin on their dog,” Fleming says. Dietary changes may improve digestion and enhance coat quality. Owners should consult their veterinarian if they have concerns about their dog’s diet. Veterinarians can help determine the next step, which may include switching to a different food. Probiotics may also help maintain a normal intestinal balance by increasing the number of beneficial bacteria. The role of the GI tract as a body’s natural defense system often is overlooked. Supporting digestive health in your dog is a key to helping ensure he performs in peak condition. Enthusiasts can help make their fall hunting season a rewarding and enjoyable experience by being cautious of potentially dangerous diseases found in the field. It is important to know your dog well and be able to readily recognize signs of something wrong. Be sure to carry a first-aid kit to treat minor injuries and be prepared to take your dog to a veterinarian for more serious injuries. Here are two diseases to be aware of when working in the field this fall. Although there is a vaccine to protect dogs from leptospirosis, it is not a core vaccine and is not widely used. A disease that is believed to be increasing, especially in the Southeastern United States, ehrlichiosis is a tick-borne illness caused by different species of Ehrlichia bacteria. Affected dogs can develop chronic inflammatory disease, bleeding problems and kidney damage. Owners may notice their dogs having fever, lethargy, loss of appetite, weight loss, and abnormal bleeding. Antibiotic treatment can be successful, though reinfection may occur because immunity is not long-lasting. If you find a tick on yourself, odds are there is at least one on your dog. Veterinarians suggest storing removed ticks in a plastic bag in your freezer with the date and location where you were. If signs of ehrlichiosis develop within two weeks, knowing the species of tick may help with the diagnosis. Recognizing the signs of dangerous diseases your dogs may be exposed to while working will help ensure you and your canine companion have a safe hunting or field trial experience.